Winner Best International Garden Design Award from Gardenista in 2015. Winner of the Silver Independent Publishers Award for Best Garden Book of 2016. 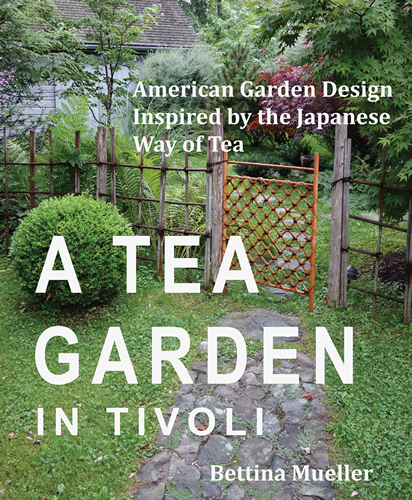 A Tea Garden in Tivoli – American Garden Design Inspired by the Way of Tea is a guide to garden design and flower arranging woven around the story of a unique garden in the Hudson Valley of New York. 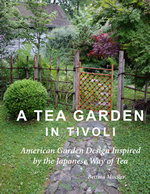 Drawing from her decades long study of the Japanese Tea tradition where great—even legendary—gardens are small by necessity, Bettina sets out to turn her 1/8 acre backyard in the small Hudson Valley village of Tivoli, New York into a private world of beauty and tranquility. “Zen student and award-winning author Bettina Mueller’s labor of love started as a bare lot adjoining her 1860 farmhouse in Tivoli. Having bought the house, she began transforming the barren grounds into an exquisite, Japanese-inspired tea garden. Imbued with the aesthetic tradition of harmony and simplicity, the living gem won Gardenista‘s 2015 Best Garden Design Award.